BCAction activists and friends after we returned toxic Walgreens products and let the store manager know that Walgreens needs to clean up their act. Cancer-linked toxins abound in our everyday products. We are working hard with our partners and allies to reform our outdated chemical regulations, and in the meantime we’re keeping the pressure on corporations to clean up their act. 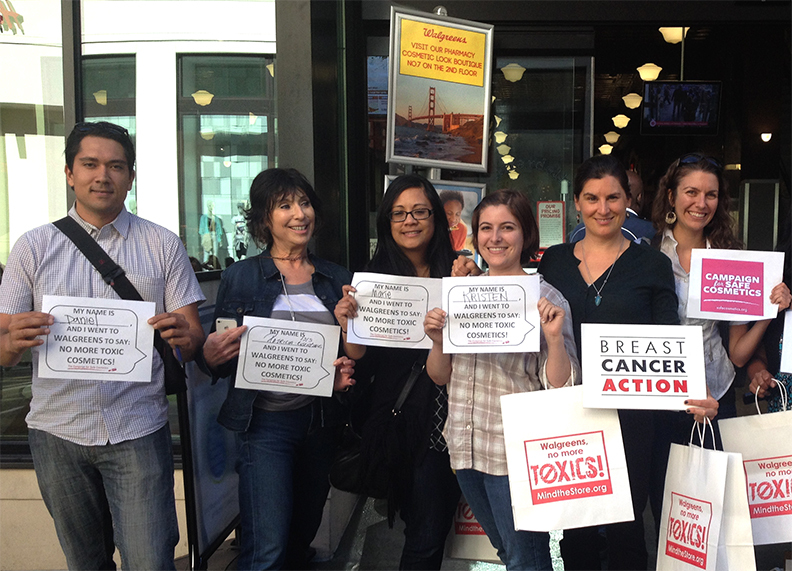 Yesterday afternoon BCAction activists returned several products containing toxic ingredients to our local Walgreens store in downtown San Francisco. We were participating in the Safer Chemicals, Healthy Families coalition’s Mind the Store campaign – yesterday was a national day of action, and people around the country went to their local Walgreens to return toxic products in protest. We were joined by our friends from the Breast Cancer Fund and the Campaign for Safe Cosmetics, who we met outside Walgreens. We gathered our toxic Walgreens products we’d previously bought and boldly marched into the store, headed for the cosmetics department. We piled our sunscreen, soap and other products onto the counter and explained that we wanted to return these items because they contain chemicals such as oxybenzone and triclosan, which are hormone disruptors linked to many health harms, including breast cancer. We handed the friendly cashier flyers about the campaign, who decided it was time to call for the store manager. We welcomed the opportunity to speak with the store manager about our concerns and about the Mind the Store campaign, so when Robert arrived, we made sure to get campaign materials into his hands and to explain why we were there. By this time, our group had grown and was attracting additional attention from shoppers, whom all got information from us about toxins in everyday products. 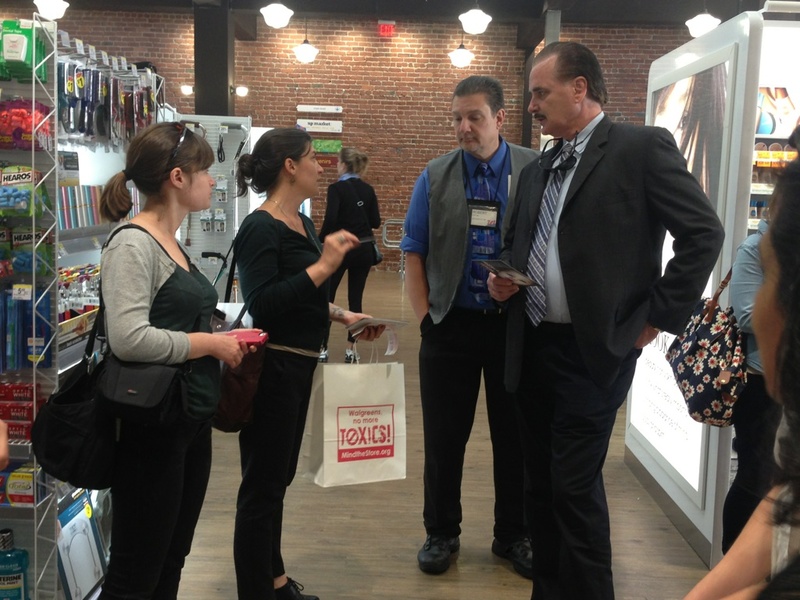 We explained to the Walgreens store manager how the products they sell can increase our risk of breast cancer. Robert, the store manager, seemed genuinely confused and concerned that Walgreens stocks and sells products containing harmful ingredients. We told him that this is common practice in U.S. corporations thanks to our toothless and broken system of regulating toxic chemicals. The Safer Chemicals, Healthy Families staff is doing a superb job communicating with Walgreens executives to pressure the company to adopt a policy to exclude certain concerning chemicals from its store shelves. Yesterday’s action, and the many like it across the country, can be very impactful because store employees learn about the problem and become concerned about stocking toxic products. We are hopeful that our action yesterday and the rest of the Mind the Store campaign actions get employees and store managers talking about a problem – both amongst themselves and their higher-ups. Many thanks to everyone who joined us, and for those who couldn’t, you can still take action by sending a letter to Walgreens’ CEO. And we must continue to keep the pressure on Congress to pass meaningful, comprehensive toxic chemical regulation so that chemicals that increase our risk of many diseases and disorders, including breast cancer, aren’t sold in ANY stores, including your local Walgreens.